In a matter of days, two traps were set in St. Paul to capture Dillinger. He managed to escape both, but gang member Eddie Green was shot in the second one, and he died several days later. On April 12, Van Meter and Dillinger robbed a police station in Warsaw, Ind., stealing firearms and bulletproof vests, and later that month Dillinger, Van Meter, Carroll, Nelson, Hamilton and others went into hiding at the Little Bohemia Lodge in northern Wisconsin. The FBI managed to track them there (see a detailed page on that incident elsewhere on this site), but once again the gang escaped after a brief shootout. However, the following day Van Meter, Dillinger and Hamilton were in a second shootout near Hastings, Minn., in which Hamilton was wounded. 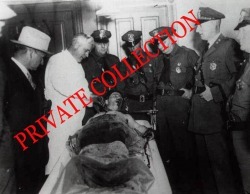 He died several days later at the home of Volney Davis, a member of the Barker-Kapis gang, and was buried near Oswego, Ill.
On May 3, Van Meter, Dillinger, and Carroll robbed the First National Bank in Fostoria, Ohio, during which Van Meter shot and wounded police chief Frank Culp. The three spent most of May hiding in a woodland cabin near East Chicago, Ind. Sometime around May 20, Carroll left for Iowa where, on June 7, he was killed in a gunfight in Waterloo. Van Meter next surfaced on May 24. He and Dillinger were driving a red panel truck through East Chicago when they were stopped by police detectives Martin O'Brien and Lloyd Mulvihill. Within minutes, Van Meter gunned down both officers with his machine gun and the pair were again on the run. The pair actually were forced to live in the van for some time. A few days later, in an attempt to conceal their identities, Van Meter and Dillinger underwent plastic surgery at the hands of Wilhelm Loeser in the apartment of Jimmy Probasco, a bar owner connected to the Chicago mob. On June 3, Loeser operated first on Dillinger and then on Van Meter, but the results did little to change their appearances. Later testimony by those involved said Van Meter was so unhappy with the results that attempted to kill Loeser on the spot but was held back by others in the room. He was rapidly losing control. The fourth man, although never identified, is believed to have been John Paul Chase, Jack Perkins or Joseph “Fatso” Negri. It was the last confirmed bank robbery for all of the participants both confirmed and suspected. 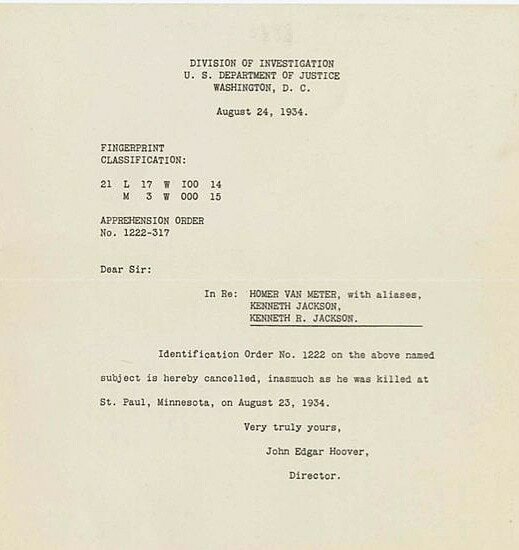 Less than a month later, on July 22, FBI agents gunned down Dillinger in Chicago. That night, Van Meter and his girlfriend Marie Comforti left for St. Paul. Within six months, Nelson and Van Meter would also be dead, and Chase, Perkins and Negri would all be in custody. 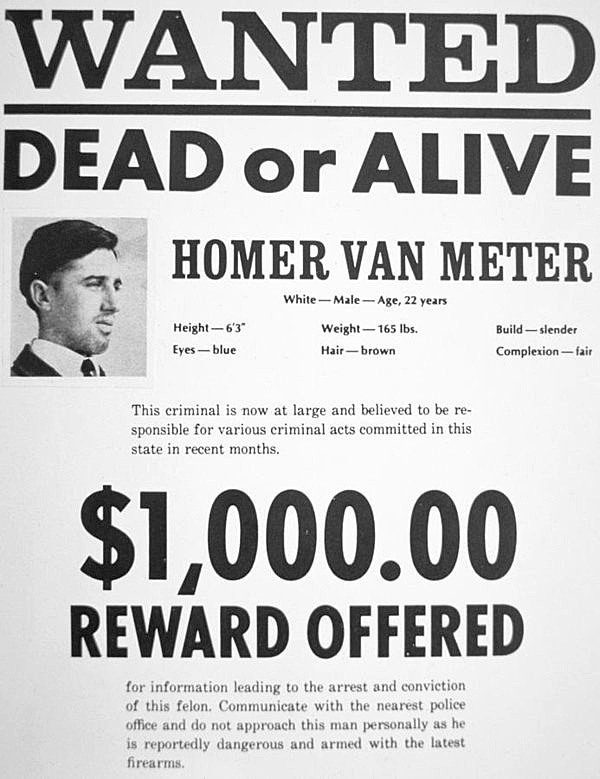 It's believed by many that Van Meter's death warrant was actually signed the day Dillinger was killed. Van Meter enjoyed the good life and was often out and about in St. Paul where he enjoyed the protection of local crime bosses, as well as police. However, his visibility only drew the attention of the FBI and that didn't sit well with his protectors who wanted him out of town. Once Dillinger had been killed, the FBI turned its attention to the Barker-Karpis gang as well as Van Meter ... and that meant on St. Paul itself because of its deep connections to the underworld and wide spread corruption that included lawyers, politicians, court officials and much of the police force. The Bakers and Karpis had the good sense to see this and left for the safety of Toledo and Cleveland, equally corrupt cities. Van Meter, however, continued to party in St. Paul despite repeated warnings by his protectors about FBI investigations into corruption and harboring. In other words, he was turning from an asset to a liability and the syndicate had had enough. On Thursday, Aug. 23, at about 5 p.m., just a month and a day since Dillinger's death, Van Meter was confronted by police at the St. Paul Auto Company, an auto dealership at the corner of Marion Street and University Avenue. Four officers were present. They were Chief Frank Cullen, Detective Tom Brown, and two others, all were armed with machine guns and shotguns. The four had been waiting for Van Meter since noon because he was expected at the dealership (which itself had deep underworld connections) that day to purchase a new car in advance of possibly leaving the area, and even the country. Brown was a former police chief who was notorious for his willingness to take bribes from criminals and also help plan crimes for which he would get a cut of the take. He had vast underworld connections, and Van Meter even contributed $1,000 to Brown's unsuccessful bid to become sheriff in exchange for safe haven in St. Paul. The pair had met several times at the Green Lantern, a roadhouse owned by Harry Sawyer and a regular hangout for gang members. Pat Reilly was the club's bartender. By this time, however, Brown had been demoted and was under investigation for corruption and allegations that he had been an accomplice (he was) to the Barker-Karpis gang in the kidnappings of William Hamm and Edward Bremer. Fact is, he received a full 25 percent of the ransom money, the largest single cut of anyone. But now he was looking to save himself by likely eliminating anyone who could tie him to criminal activities. Van Meter arrived at the St. Paul Auto Company about 4:30 and spoke with manager H.H. McGill about a purchase. McGill, who claimed not to know Van Meter, said he was polite and they discussed the new car's accessories and the possible trade-in value of Van Meter's current car. McGill said he suggested Van Meter return the following day with his car so he could evaluate it for trade-in. As Van Meter was leaving the dealership, he was confronted by the police and ordered to stop and put up his hands. The four officers later claimed he ignored their command and pulled out his .45 as he ran across the street and into an alley. They said he fired at them twice, and a .45 found near Van Meter's body with his fingerprints on it had been fired twice. Cullen, armed with a rifle, said he never returned fire because a bystander had walked in front of him, but that the others opened fire on Van Meter, who immediately fell dead. He was 28-years-old. Brown, it was later reported, continued to fire at Van Meter after he fell. The impact of the bullets ripped off one finger and nearly severed the thumb and another finger of his right hand. One report said Brown's initial shotgun blast lifted Van Meter off the ground and threw him back about two feet. The blast hit him in the chest and face. Another report said Van Meter was down on one knee and about to fire on police when they shot him. 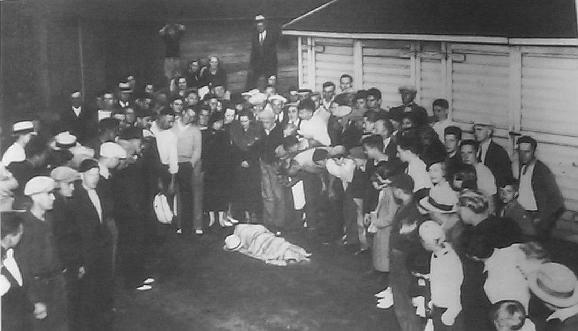 Police retrieved a straw hat Van Meter had been holding and placed it on Van Meter's face as onlookers began surrounding the body ... and digging bullets out of the buildings. The four officers reportedly found $1,323 in Van Meter’s pocket, but his friends and associates claimed he was carrying at least $10,000 (about $180,000 in 2016 money) that night because he was planning to leave the area for good. A number of explanations as to who betrayed Van Meter have been advanced since his death, usually involving the names of St. Paul crime bosses Harry Sawyer and Jack Peifer, and that of St. Paul bank robber Tommy Gannon. Fact is, there are more than a half dozen contradictory police versions of what happened that day and the events leading up to it. Brown himself gave at least three different versions of the shooting itself in the days following it. What is most telling, however, are statements made by some of the numerous witnesses on that busy street who saw the event unfold from a variety of angles ... from the auto dealer to a young mother whom Van Meter nearly collided with as he ran past her to a motorist who slammed on his brakes to avoiding hitting Van Meter to a witness who was standing near the alley. There is one common thread that binds all the witnesses' stories: Not one saw Van Meter fire a gun, or even holding a gun, as he ran across the street. Only the police saw him fire a gun. The young mother, Mrs. Andrew Stedje (the woman who stepped into Cullen's line of fire) gave a detailed description of what Van Meter was wearing ... and it perfectly matched police reports. She said as he ran past her she noticed he was "handsome" and was "very well dressed" with two-tone black and white shoes, a well-tailored dark blue suit, a white shirt, a light-colored summer tie, and he was carrying a straw hat. The motorist, identified only as D. Peterson, said as Van Meter ran into the street in front of Peterson's blue Hudson, he held up his hand to stop Peterson. The driver said there was nothing in the hand he held up, but noted he was holding a straw hat in his other hand. The auto dealer, whose dealership Van Meter had just been in, said as Van Meter left the showroom and was confronted by police, he removed his hat as he began running across the street. The dealer mentioned the hat, but said nothing about a gun. Finally, a fourth unidentified witness who was standing across the street from the auto dealership and a few doors down from the alley entrance, said he saw Van Meter run into traffic and across the street. He said he saw Van Meter hold up a hand forcing a motorist (Peterson) to slam on the brakes. He said there was nothing in his hand, but that he was holding a "nice looking" straw hat in his other hand. He said he saw Van Meter run into the alley followed by two men carrying shotguns. It was then he heard gun shots. According to a 1939 FBI interview with Thomas Kirwin, a handyman who worked on Sawyer’s farm north of St. Paul where both Gannon and Van Meter had been harbored, it was Gannon who betrayed Van Meter. Kirwin said Gannon was given all of Van Meter’s guns, while Peifer and Sawyer split Van Meter’s $10,000 with the four who shot him. That same year, the FBI announced that it believed Sawyer had set up Van Meter to get at his money, splitting the take with the four officers who did the shooting ... but none of these theories have been confirmed. There's even question as to how Van Meter arrived at the dealership. Police reports say he walked there, but at least one witness said he arrived in a dark-colored Chevy with two other men, one of whom was believed to be Gannon. The witness said when Van Meter ran from the dealership toward the car, one of the two men slid into the driver's seat and the two simply drove away leaving him on the sidewalk. The bottom line, however, is Van Meter was clearly set up. While it's highly likely he was armed, there's no solid evidence Van Meter ever actually fired at police, or even removed his gun. It's also likely that once Van Meter saw Brown and the others holding their weapons, he realized he had been betrayed. Their weapons were out; his wasn't. It made little sense to attempt a shoot-out on the street since there was no way he could get the best of four policemen. Van Meter probably realized his best chance was to run into traffic since the police were unlikely to shoot with so many innocent people in the area. It was a good idea that might have worked had he avoided the alley and stayed in traffic for a couple more blocks. 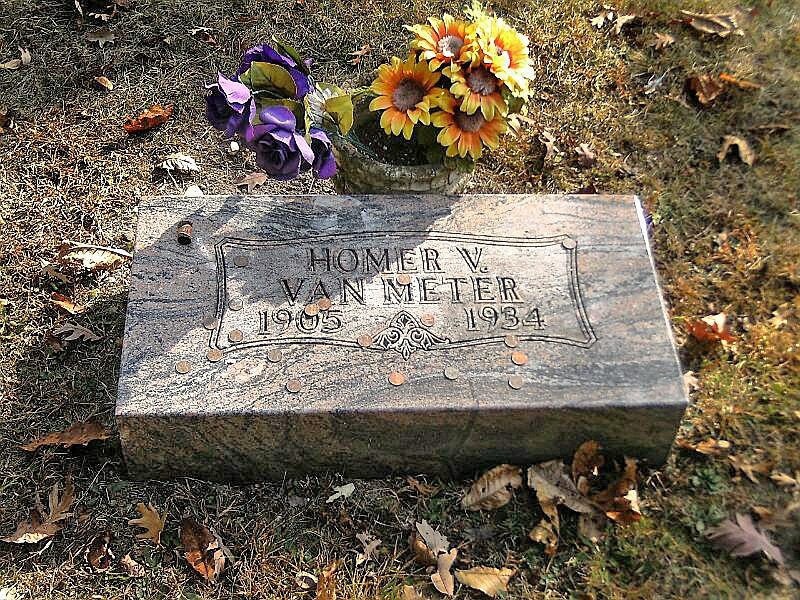 Van Meter is buried in Lindenwood Cemetery, in Fort Wayne, Ind. According to family members, he is not buried within the family plot due to shame. A crowd views Van Meter's body, still in the alley. At right, officers view him at the morgue. Van Meter in the morgue. Hoover's order canceling the search for Van Meter. Van Meter's grave.